There are more than 5,97,541 Shopify customers in the United States alone. Now imagine the number of stores a brand needs to compete with around the world. No matter what you sell, how much of a discount you offer and what marketing budget you set aside, it is never enough. But what is it that a Shopify Plus store is missing when it comes to increasing on-site conversions? We’re not talking about the distractions offline. An online shopper could be at home, in the office or even commuting. Those are things that you can’t change. We’re talking about the distractions caused by browser adware on your site itself – yes, the one that you optimized for higher conversions. But what’s worse is that you can’t see it. How does browser adware reach your Shopify Plus store? Well, it is not you. It is your consumer. While Shopify Plus stores have a secure infrastructure, the consumer’s web browser often becomes their weakest link. A typical internet user has at least ten browser extensions and web apps installed. While they serve the purpose of making them more productive, compare products across sites and more, there is a high chance they’re infected with adware. And no, it’s not just Shopify Plus stores that are at risk here. Even Amazon’s sales were impacted by adware. They even filed a lawsuit citing the sophisticated and widespread nature of adware. The reason being, the losses were way beyond those that could be ignored. Do these adware injected distractions impact your Shopify Plus store sales? Distractions caused by browser injected ads impact your Shopify Plus store conversions (and sales) in more ways than one. Imagine you walk into a store looking for a pair of jeans. You try out a few items and choose the one you like. Just when you’re about to make a purchase, you notice another store put up a hoarding. They are offering 20% more discount on a similar pair of jeans. You would drop the jeans in hand and walk to the other store to try out the product. You want to be able to make the best purchase at the best price – even if that means trying a new brand. The same holds true while shopping online. You go to a store with something in mind. You sift through the products to look for what suits you the best. Now if an ad promotes a similar product or a better deal, you’re obviously going to want to know more. To do that, you’ll click the promotion. That’s when as a shopper, you’ll know that you’re being taken to another site. And as the eCommerce store owner, you’re going to lose a customer. You can’t possibly expect a shopper to come back to your site to make a purchase now. That’s just too much effort! Studies suggest that a one-second delay in page load time results in a loss of 7% conversions. It also results in 11% fewer page views on your store. Imagine you want something to be delivered the next day. You go to an online store expecting to find the product and place the order quickly. But it takes ages for the search results to load or the product page to open up. You’re instantly put off by the experience and seek another site you could place the order on. That’s what browser injected ads do. They are not designed to be lightweight. They just want to inject themselves on every page possible – especially video ads. Online shopping is all about the customer experience you can offer. Right from the time a shopper lands on your site, everything comes under the ‘experience’ radar. The search functionality, product images, and videos, descriptions and how easy it is to complete a purchase, everything accounts for how high or low your conversion rate will be. Now your site has a high page load time and each of the pages are cluttered with distracting ads. So how do you even imagine delivering a great experience? 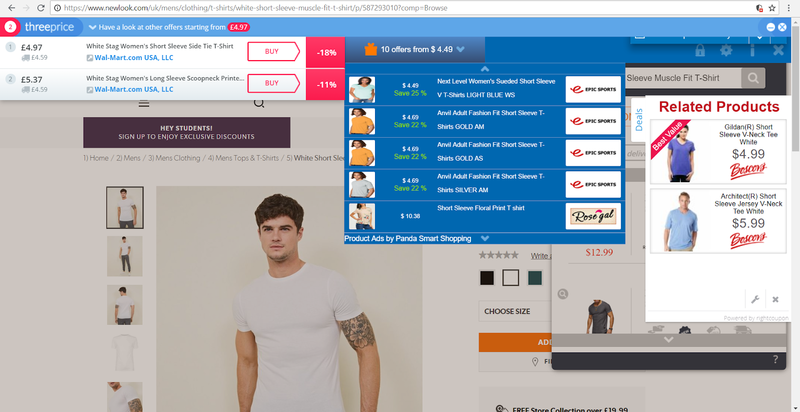 Take a look at this store that is infected with adware. The browser injected ads have practically taken over the complete product page. Let’s imagine your shopper somehow has patience. He doesn’t mind waiting for the page to load and maneuvers his way around all the distractions he is targeted with. But what happens when a competitor deal shows up? An online shopper is always looking for better deals. They don’t really care about which store buying from. 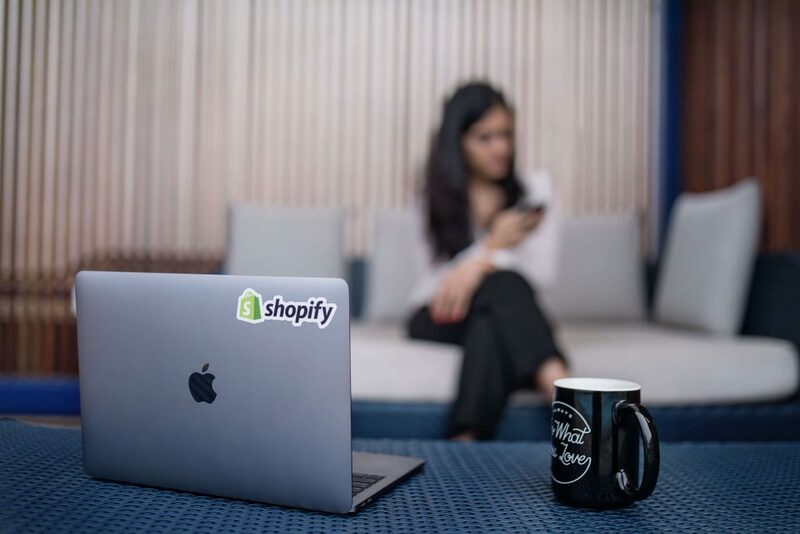 Considering the increasing of Shopify Plus stores, it is safe to assume that on spotting a higher discount, a shopper’s choice is clear. But we’re talking about how those competitor discounts get promoted on your store itself. Yes, that’s what adware does. 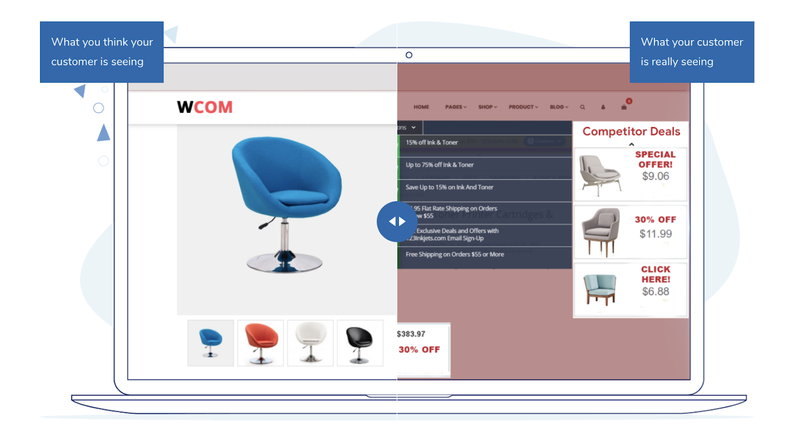 It targets shoppers with competitor deals on your product and checkout pages. Even if the shopper has been a loyal customer before, they are bound to check them out because they look sophisticated and non-spammy. As we said before, once the shopper has left your site, they’re as good as gone. You’ll experience a very high cart abandonment rate. Now you might turn around to ask how is it even possible to identify adware on the consumer’s browser. You’re right. It’s not simple. Every shopper has different browser extensions and apps installed. Therefore, each one of them sees a different distraction. 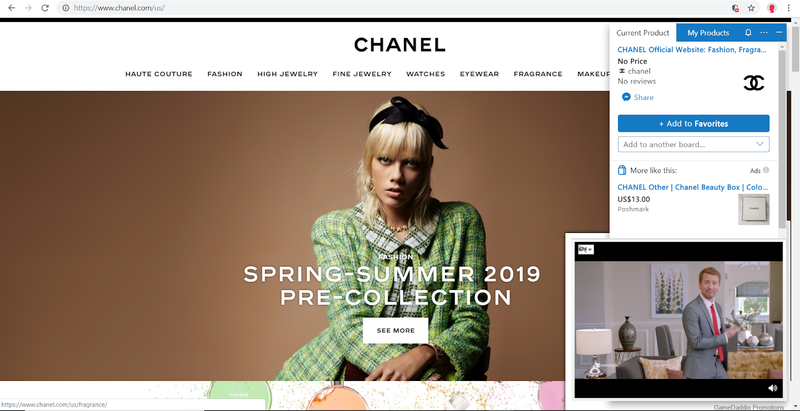 It’s not just difficult to identify which adware strain injected these distracting ads, but also what kind of ads are being shown to your shoppers. The only way to combat these distractions is to remove them before they show up. For that, you need a tool that helps you identify adware strains proactively and block the ads they inject before your shopper is exposed to them – all on the consumer’s browser. No distractions. Higher on-site conversions. In fact, top brands like Kirkland’s, Nine West and others have increased their conversion rates by a whopping 16% by using this little hack. And now your Shopify Plus store can do the same. Shield by BrandLock uses machine learning to identify and categorize adware strains on a daily basis. It then predicts and removes the distractions caused by browser injected ads – before any of them get injected onto your product or checkout pages. How does Shield remove adware from Shopify Plus stores? PrevPreviousCan Consumer Browser Adware Impact Your eCommerce Sales?